A week doesn't go by that we don't get a call or email asking where is the MOO JUICE?! It's back. 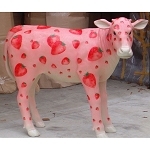 Sweet strawberry with vanilla ice cream flavors make Moo the perfect strawberry-creamy-sweet combination. Moo Juice lovers, rejoice! Ingredients Include: Propylene Glycol (USP Grade), Glycerine (USP Grade), FEMA/GRAS approved food flavoring and optional nicotine. I've been ordering from ALTCIG for a while and I was in love with their churro flavor. I decided to try something different and fell in love with Moo Juice. I've been searching for a good Strawberry and Cream juice for a while. It's absolutely amazing. Good right out the bottle, even better after a little steeping. Best Strawberry and Cream flavor i've ever tasted! I would have to say I like it better than Suicide Bunny's Mother's Milk, and it's a lot cheaper too! It's currently my ADV and i'll be back to order a big bottle! I highly recommend this juice and Banana Milkshake! I love the moo juice. I received it as a tester, but I am definitely going to order some more. I ABSOLUTELY love this ejuice!!! Simply wonderful!!! It has become my adv, I am ordering a BIGGER bottle this time!! Thanks ALTCig, ya'll are amazing. Just a wonderful, great experience all the around!! I highly recommend this juice!! and ALTCig!!! I got this as a small sample and I am so grateful because I may never have thought to purchase it. So far it is my favorite, I'm in love and have been vaping way too much because of it. I can compare it to a strawberry milkshake, but my initial thought was that it tasted like the milk left over from eating a sugary cereal like fruity pebbles. I just love it! Best juice I've tried so far!!! I've never cared much for fruity flavors, they sounded so good, but the taste wasn't there. I kept searching and hearing such great things I gave it a try. It is so amazing, perfect strawberry cream flavor that keeps getting better every time I fill up my tank. This is the juice I keep in my nautilus tank and cannot put down! It will be the juice I order again and again. Try it, you won't regret it! Amazing when mixed with the banana milkshake as well!!! Just filled a tank with this about an hour ago, and it is almost gone. This is a great juice! The perfect blend of strawberries and cream. Will be buying again. Altcig has been my favorite e-juice supplier for over two years now and I can't believe I'm just now trying Moo juice. I am absolutely in love with it. It's just perfect and extremely yummy! Think of Nestle strawberry quick but even better. Smooth, creamy, and delicious. Great work, altcig! I got a free sample of this and could not wait to get a bigger size! This stuff is great... Takes me back to being a kid and having my favorite strawberry milk drink!!! Give it a try. You won't regret it! I requested moo juice as a sample and now I even regret not buying a full order. I ordered the zero nicotine and the flavor is so abundant and wholesome. I can't put it down. I ordered the Churro, Vanilla Love, and the Gooey Butter Cookie and I have to say... Moo Juice takes it all!! I'm not a fan favorite with fruit flavors but this just kills every fruit flavor there is in the market!! I can't put it down. I WANT MORE!! Thank you for bringing this one back! I'm not a big lover of fruity flavors..but this juice is awesome! It has a creamy flavor with just enough strawberry. Perfect, not overpowering flavor. This is an all day vape for me. Wow Altcig this stuff is legit! Don't usually vape fruit flavors, received this as a sample gave it a try and man oh man can't stop vaping it. Rich,smooth, creamy perfect amount of strawberry flavor love it. Thank You for the sample ordering me a big bottle now! My Moo is BACK! Thank you! This sweet, creamy rich strawberry juice reminds me of an old fashioned diner shake made with real fruit and ice cream. Thank you for bringing it back!